Injuries and accidents are not reserved for particular parts of the home; they happen everywhere people move about. But certain dangers are more prevalent, including those associated with particular household activities. Domestic circumstances are generally pretty safe, but false complacency should not stimulate foolish behavior. 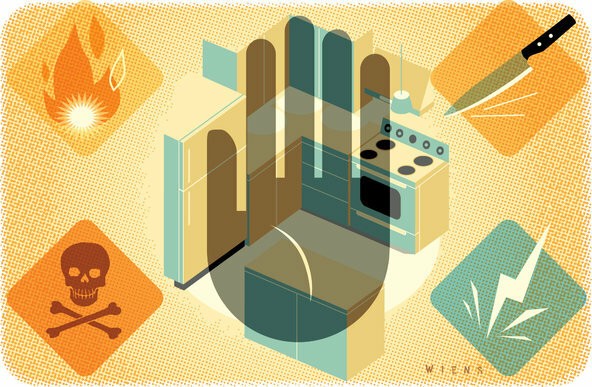 Regardless of how mundane in appearance, regular daily activities harbor hidden dangers for home owners and apartment dwellers, especially in their kitchens. Well-trained TV cooks are particularly adept at high-speed cutting and chopping, carried out with extremely sharp cutlery, in dramatic fashion. While it makes for good tele, some viewers forget that these are professionals, with years of experience. Attempting to replicate the speed and accuracy displayed by seasoned knife-handlers is not advised for novice cooks. Knife handling is a precise science, and like any other, carries specific safe handling protocols. Edged tools, for starters, should always be stored properly. Sharp blades should be covered or protected, to keep them sharp, but also to hedge against injuries caused by unsafe storage. Unsheathed knives in drawers, for example, are setting the stage for hurried cooks to reach in and sustain cuts. Dull knives are not the answer though, since they require greater force to operate. As a result, it is believed that dull knives cause greater numbers of cuts than those which are sharp enough to easily cut through food. Proper technique is also essentials for long-term injury avoidance when using knives. Fingertips should never be placed in the path of sharp knives, so items being cut should be held in place with knuckles instead. Knives are not the only hand-held kitchen implements harboring potential hazards. Anything with a pointed feature – corkscrew, ice pick, skewer, requires a mindful approach to safety during use. Puncture wounds can be as serious as knife cuts, in some cases, so they should not be dismissed as superficial. Hand tools are volatile in the wrong hands, but items that require electrical power have even more dangerous features. Adding propulsion, and electrical backing, gives powered tools like blenders, mixers, and beaters more power than their hand-held counterparts, upping the ante on danger. Cuts and tearing injuries are furnished for those who do not lend proper credence to the safety tenets of electric appliance use. To maintain safety standards, never extend your hand into an operative appliance like a blender, until you are sure it is unplugged, and the blade assembly has been removed from the unit. Even appliances without sharp blades, like dough mixers and pasta makers, have enough power to grab fingers and twist them to injury. Installed kitchen helpers, like garbage disposals are also problematic for some users. Unlike countertop appliances, hard-wired units cannot be readily unplugged, so safe users must steer clear of moving parts entirely. One of the greatest kitchen hazards is heat. Burns and house fires are common results of operator error on the stovetop, and in cases of oven-related accidents. Burners, especially some modern versions, are not as obvious when activated, as some of their predecessors, setting the stage for accidental fires and burns. Managing the area surrounding cooking appliances is essential to prolonged safety. Towels and paper goods should never be store loosely around stovetops and ovens. Many kitchen fires stem from combustible materials accidentally catching fire because they come in contact with a heat source. Kitchen chemicals, for cleaning and home maintenance pose hazards when they are not contained properly, and when they are placed proximate to eating areas and kitchen appliances. When comprehensive safety information is not available, it is prudent to store household goods separately, to avoid hazardous interactions between chemicals.